Does Takeshi Miike sleep? He must as some point, but it can’t be all that much, the guy is busy. The gonzo Japanese auteur of the outrageous has directed 100 movies. That’s insane. His hundredth, Blade of the Immortal, screens at Fantastic Fest next month and just dropped an appropriately loony new trailer. Miike’s filmography admittedly has some bumpy terrain—I stopped trying to keep up with his output like a decade ago. But the highs are deliriously high. Audition is an all-timer, so are Ichi the Killer, Happiness of the Katakuris, and 13 Assassins. He’s made a Django movie, a slew of ultraviolent Yakuza films, and even an action comedy for kids. The man is all over the map, but this Blade of the Immortal looks great and hits all of his hallmarks. It’s got a wingnut story about a samurai who can’t die, pitch black comedy, and, of course, blood geysers galore. It reminds me of a Feudal-Japan-set take on True Grit. In short, this adaptation of Hiroaki Samura’s manga series has the potential to be off-the-charts good times. 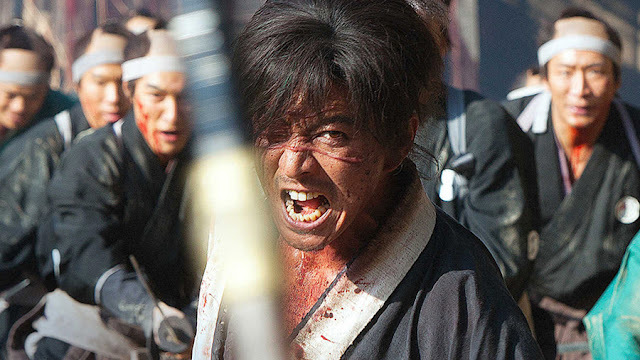 Fantasy, horror, severed limbs, revenge, grim badasses cracking wise, Blade of the Immortal has all of the things. It’s sure to get a warm reception at Fantastic Fest, and for the rest of us, Magnet releases the film in a select number of theaters on November 3. If history holds, they’ll also likely drop it on VOD on or around the same date.